Javier Villanueva­Meyer, MD, is an Assistant Professor of Clinical Radiology in the Neuroradiology subspecialty section in the Department of Radiology and Biomedical Imaging at the University of California, San Francisco. He received his medical degree from Baylor College of Medicine in Houston, Texas, and he completed his one-year internship at Virginia Tech Carilion School of Medicine in Roanoke. Dr. Villanueva­Meyer completed his four-year diagnostic radiology residency at the UCSF, followed by a Neuroradiology fellowship at UCSF. 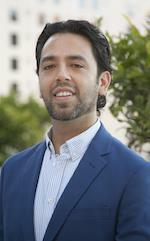 He also completed a NIH T32 post-doctoral fellowship in the UCSF Department of Radiology and Biomedical Imaging. Dr. Villanueva-Meyer’s interests focus on advanced MR imaging and imaging based tools to better delineate and characterize brain tumors. His research also involves molecular imaging where he works with collaborators within and outside of our department to develop and implement the use of PET radiotracers in both brain tumors and spinal infection. Dr. Villanueva­Meyer has experience in CT, MRI and plain film radiography of the brain, head and neck, spine, and peripheral nervous system in both the inpatient and outpatient settings. As well as diagnostic and therapeutic neuroradiology procedures, including percutaneous biopsy, lumbar puncture, myelography, cisternography, epidural and selective nerve root injection. Wang ZJ, Ohliger MA, Larson PEZ, Gordon JW, Bok RA, Slater J, Villanueva-Meyer JE, Hess CP, Kurhanewicz J, Vigneron DB. Hyperpolarized 13C MRI: State of the Art and Future Directions. Radiology. 2019 Mar 05; 182391. Baal JD, Chen WC, Solomon DA, Pai JS, Lucas CH, Hara JH, Oberheim Bush NA, McDermott MW, Raleigh DR, Villanueva-Meyer JE. Preoperative MR Imaging to Differentiate Chordoid Meningiomas from Other Meningioma Histologic Subtypes. AJNR Am J Neuroradiol. 2019 Mar; 40(3):433-439. Chen Y, Villanueva-Meyer JE, Morrison MA, Lupo JM. Correction to: Toward Automatic Detection of Radiation-Induced Cerebral Microbleeds Using a 3D Deep Residual Network. J Digit Imaging. 2019 Feb 08. Lee JC, Villanueva-Meyer JE, Ferris SP, Sloan EA, Hofmann JW, Hattab EM, Williams BJ, Guo H, Torkildson J, Florez A, Van Ziffle J, Onodera C, Grenert JP, Cho SJ, Horvai AE, Jones DTW, Pfister SM, Koelsche C, von Deimling A, Korshunov A, Perry A, Solomon DA. Primary intracranial sarcomas with DICER1 mutation often contain prominent eosinophilic cytoplasmic globules and can occur in the setting of neurofibromatosis type 1. Acta Neuropathol. 2019 Jan 16. Chen Y, Villanueva-Meyer JE, Morrison MA, Lupo JM. Toward Automatic Detection of Radiation-Induced Cerebral Microbleeds Using a 3D Deep Residual Network. J Digit Imaging. 2018 Dec 03. Villanueva-Meyer JE, Chang P, Lupo JM, Hess CP, Flanders AE, Kohli M. Machine Learning in Neurooncology Imaging: From Study Request to Diagnosis and Treatment. AJR Am J Roentgenol. 2019 Jan; 212(1):52-56. Behr SC, Villanueva-Meyer JE, Li Y, Wang YH, Wei J, Moroz A, Lee JK, Hsiao JC, Gao KT, Ma W, Cha S, Wilson DM, Seo Y, Nelson SJ, Chang SM, Evans MJ. Targeting iron metabolism in high-grade glioma with 68Ga-citrate PET/MR. JCI Insight. 2018 Nov 02; 3(21). Villanueva-Meyer JE, Magill ST, Lee JC, Umetsu SE, Flavell RR. Detection of Metastatic Meningioma to the Liver Using 68Ga-DOTA-Octreotate PET/CT. Clin Nucl Med. 2018 Sep; 43(9):e338-e340. Morin O, Vallières M, Jochems A, Woodruff HC, Valdes G, Braunstein SE, Wildberger JE, Villanueva-Meyer JE, Kearney V, Yom SS, Solberg TD, Lambin P. A Deep Look Into the Future of Quantitative Imaging in Oncology: A Statement of Working Principles and Proposal for Change. Int J Radiat Oncol Biol Phys. 2018 Nov 15; 102(4):1074-1082. Solomon DA, Korshunov A, Sill M, Jones DTW, Kool M, Pfister SM, Fan X, Bannykh S, Hu J, Danielpour M, Li R, Johnston J, Cham E, Cooney T, Sun PP, Oberheim Bush NA, McDermott M, Van Ziffle J, Onodera C, Grenert JP, Bastian BC, Villanueva-Meyer JE, Pekmezci M, Bollen AW, Perry A. Myxoid glioneuronal tumor of the septum pellucidum and lateral ventricle is defined by a recurrent PDGFRA p.K385 mutation and DNT-like methylation profile. Acta Neuropathol. 2018 Aug; 136(2):339-343. Hara JH, Wu A, Villanueva-Meyer JE, Valdes G, Daggubati V, Mueller S, Solberg TD, Braunstein SE, Morin O, Raleigh DR. Clinical Applications of Quantitative 3-Dimensional MRI Analysis for Pediatric Embryonal Brain Tumors. Int J Radiat Oncol Biol Phys. 2018 Nov 15; 102(4):744-756. Pekmezci M, Villanueva-Meyer JE, Goode B, Van Ziffle J, Onodera C, Grenert JP, Bastian BC, Chamyan G, Maher OM, Khatib Z, Kleinschmidt-DeMasters BK, Samuel D, Mueller S, Banerjee A, Clarke JL, Cooney T, Torkildson J, Gupta N, Theodosopoulos P, Chang EF, Berger M, Bollen AW, Perry A, Tihan T, Solomon DA. The genetic landscape of ganglioglioma. Acta Neuropathol Commun. 2018 Jun 07; 6(1):47. Qin H, Carroll VN, Sriram R, Villanueva-Meyer JE, von Morze C, Wang ZJ, Mutch CA, Keshari KR, Flavell RR, Kurhanewicz J, Wilson DM. Imaging glutathione depletion in the rat brain using ascorbate-derived hyperpolarized MR and PET probes. Sci Rep. 2018 May 21; 8(1):7928. Mutch CA, Ordonez AA, Qin H, Parker M, Bambarger LE, Villanueva-Meyer JE, Blecha J, Carroll V, Taglang C, Flavell R, Sriram R, VanBrocklin H, Rosenberg O, Ohliger MA, Jain SK, Neumann KD, Wilson DM. [11C]Para-Aminobenzoic Acid: A Positron Emission Tomography Tracer Targeting Bacteria-Specific Metabolism. ACS Infect Dis. 2018 Jul 13; 4(7):1067-1072. Sriram R, Sun J, Villanueva-Meyer J, Mutch C, De Los Santos J, Peters J, Korenchan DE, Neumann K, Van Criekinge M, Kurhanewicz J, Rosenberg O, Wilson D, Ohliger MA. Detection of Bacteria-Specific Metabolism Using Hyperpolarized [2-13C]Pyruvate. ACS Infect Dis. 2018 May 11; 4(5):797-805. Villanueva-Meyer JE, Wood MD, Choi BS, Mabray MC, Butowski NA, Tihan T, Cha S. MRI Features and IDH Mutational Status of Grade II Diffuse Gliomas: Impact on Diagnosis and Prognosis. AJR Am J Roentgenol. 2018 Mar; 210(3):621-628. Lambert JW, Phillips ED, Villanueva-Meyer JE, Nardo L, Facchetti L, Gould RG. Axial or Helical? Considerations for wide collimation CT scanners capable of volumetric imaging in both modes. Med Phys. 2017 Nov; 44(11):5718-5725. Barajas RF, Villanueva-Meyer J, Perry A, Berger M, Cha S. Biologically aggressive regions within glioblastoma identified by spin-lock contrast T1 relaxation in the rotating frame (T1?) MRI. Radiol Case Rep. 2017 Dec; 12(4):827-832. Villanueva-Meyer JE, Mabray MC, Cha S. Current Clinical Brain Tumor Imaging. Neurosurgery. 2017 Sep 01; 81(3):397-415. Neumann KD, Villanueva-Meyer JE, Mutch CA, Flavell RR, Blecha JE, Kwak T, Sriram R, VanBrocklin HF, Rosenberg OS, Ohliger MA, Wilson DM. Imaging Active Infection in vivo Using D-Amino Acid Derived PET Radiotracers. Sci Rep. 2017 Aug 11; 7(1):7903. Tremblay MA, Villanueva-Meyer JE, Cha S, Tihan T, Gelfand JM. Clinical and imaging correlation in patients with pathologically confirmed tumefactive demyelinating lesions. J Neurol Sci. 2017 Oct 15; 381:83-87. Villanueva-Meyer JE, Han SJ, Cha S, Butowski NA. Early tumor growth between initial resection and radiotherapy of glioblastoma: incidence and impact on clinical outcomes. J Neurooncol. 2017 Aug; 134(1):213-219. Villanueva-Meyer JE, Barajas RF, Mabray MC, Chen W, Shankaranarayanan A, Koon P, Barani IJ, Tihan T, Cha S. Differentiation of brain tumor-related edema based on 3D T1rho imaging. Eur J Radiol. 2017 Jun; 91:88-92. Ehman EC, Johnson GB, Villanueva-Meyer JE, Cha S, Leynes AP, Larson PEZ, Hope TA. PET/MRI: Where might it replace PET/CT? J Magn Reson Imaging. 2017 11; 46(5):1247-1262. Villanueva-Meyer JE, Naeger DM, Courtier JL, Hope MD, Lambert JW, MacKenzie JD, Phelps AS. Pediatric chest CT at chest radiograph doses: when is the ultralow-dose chest CT clinically appropriate? Emerg Radiol. 2017 Aug; 24(4):369-376. Aboian MS, Solomon DA, Felton E, Mabray MC, Villanueva-Meyer JE, Mueller S, Cha S. Imaging Characteristics of Pediatric Diffuse Midline Gliomas with Histone H3 K27M Mutation. AJNR Am J Neuroradiol. 2017 04; 38(4):795-800. Mabray MC, Cohen BA, Villanueva-Meyer JE, Valles FE, Barajas RF, Rubenstein JL, Cha S. Performance of Apparent Diffusion Coefficient Values and Conventional MRI Features in Differentiating Tumefactive Demyelinating Lesions From Primary Brain Neoplasms. AJR Am J Roentgenol. 2015 Nov; 205(5):1075-85. Mabray MC, Barajas RF, Villanueva-Meyer JE, Zhang CA, Valles FE, Rubenstein JL, Cha S. The Combined Performance of ADC, CSF CXC Chemokine Ligand 13, and CSF Interleukin 10 in the Diagnosis of Central Nervous System Lymphoma. AJNR Am J Neuroradiol. 2016 Jan; 37(1):74-9. Villanueva-Meyer JE, Cha S. From Shades of Gray to Microbiologic Imaging: A Historical Review of Brain Abscess Imaging: RSNA Centennial Article. Radiographics. 2015 Sep-Oct; 35(5):1555-62. Villanueva-Meyer J, Glastonbury C, Marcovici P. Congenital midline cervical cleft. J Radiol Case Rep. 2015 Mar; 9(3):7-11. Phelps AS, Naeger DM, Courtier JL, Lambert JW, Marcovici PA, Villanueva-Meyer JE, MacKenzie JD. Pairwise comparison versus Likert scale for biomedical image assessment. AJR Am J Roentgenol. 2015 Jan; 204(1):8-14. Bakken TE, Roddey JC, Djurovic S, Akshoomoff N, Amaral DG, Bloss CS, Casey BJ, Chang L, Ernst TM, Gruen JR, Jernigan TL, Kaufmann WE, Kenet T, Kennedy DN, Kuperman JM, Murray SS, Sowell ER, Rimol LM, Mattingsdal M, Melle I, Agartz I, Andreassen OA, Schork NJ, Dale AM, Weiner M, Aisen P, Petersen R, Jack CR, Jagust W, Trojanowki JQ, Toga AW, Beckett L, Green RC, Saykin AJ, Morris J, Liu E, Montine T, Gamst A, Thomas RG, Donohue M, Walter S, Gessert D, Sather T, Harvey D, Kornak J, Dale A, Bernstein M, Felmlee J, Fox N, Thompson P, Schuff N, Alexander G, DeCarli C, Bandy D, Koeppe RA, Foster N, Reiman EM, Chen K, Mathis C, Cairns NJ, Taylor-Reinwald L, Trojanowki JQ, Shaw L, Lee VM, Korecka M, Crawford K, Neu S, Foroud TM, Potkin S, Shen L, Kachaturian Z, Frank R, Snyder PJ, Molchan S, Kaye J, Quinn J, Lind B, Dolen S, Schneider LS, Pawluczyk S, Spann BM, Brewer J, Vanderswag H, Heidebrink JL, Lord JL, Johnson K, Doody RS, Villanueva-Meyer J, Chowdhury M, Stern Y, Honig LS, Bell KL, Morris JC, Ances B, Carroll M, Leon S, Mintun MA, Schneider S, Marson D, Griffith R, Clark D, Grossman H, Mitsis E, Romirowsky A, deToledo-Morrell L, Shah RC, Duara R, Varon D, Roberts P, Albert M, Onyike C, Kielb S, Rusinek H, de Leon MJ, Glodzik L, De Santi S, Doraiswamy PM, Petrella JR, Coleman RE, Arnold SE, Karlawish JH, Wolk D, Smith CD, Jicha G, Hardy P, Lopez OL, Oakley M, Simpson DM, Porsteinsson AP, Goldstein BS, Martin K, Makino KM, Ismail MS, Brand C, Mulnard RA, Thai G, Mc-Adams-Ortiz C, Womack K, Mathews D, Quiceno M, Diaz-Arrastia R, King R, Weiner M, Martin-Cook K, DeVous M, Levey AI, Lah JJ, Cellar JS, Burns JM, Anderson HS, Swerdlow RH, Apostolova L, Lu PH, Bartzokis G, Silverman DH, Graff-Radford NR, Parfitt F, Johnson H, Farlow MR, Hake AM, Matthews BR, Herring S, van Dyck CH, Carson RE, MacAvoy MG, Chertkow H, Bergman H, Hosein C, Black S, Stefanovic B, Caldwell C, Hsiung R, Feldman H, Mudge B, Assaly M, Kertesz A, Rogers J, Trost D, Bernick C, Munic D, Kerwin D, Mesulam MM, Lipowski K, Wu CK, Johnson N, Sadowsky C, Martinez W, Villena T, Turner RS, Johnson K, Reynolds B, Sperling RA, Johnson KA, Marshall G, Frey M, Yesavage J, Taylor JL, Lane B, Rosen A, Tinklenberg J, Sabbagh M, Belden C, Jacobson S, Kowall N, Killiany R, Budson AE, Norbash A, Johnson PL, Obisesan TO, Wolday S, Bwayo SK, Lerner A, Hudson L, Ogrocki P, Fletcher E, Carmichael O, Olichney J, Kittur S, Borrie M, Lee TY, Bartha R, Johnson S, Asthana S, Carlsson CM, Potkin SG, Preda A, Nguyen D, Tariot P, Fleisher A, Reeder S, Bates V, Capote H, Rainka M, Scharre DW, Kataki M, Zimmerman EA, Celmins D, Brown AD, Pearlson GD, Blank K, Anderson K, Santulli RB, Schwartz ES, Sink KM, Williamson JD, Garg P, Watkins F, Ott BR, Querfurth H, Tremont G, Salloway S, Malloy P, Correia S, Rosen HJ, Miller BL, Mintzer J, Longmire CF, Spicer K, Finger E, Rachinsky I, Drost D, Jernigan T, McCabe C, Grant E, Ernst T, Kuperman J, Chung Y, Murray S, Bloss C, Darst B, Pritchett L, Saito A, Amaral D, DiNino M, Eyngorina B, Sowell E, Houston S, Soderberg L, Kaufmann W, van Zijl P, Rizzo-Busack H, Javid M, Mehta N, Ruberry E, Powers A, Rosen B, Gebhard N, Manigan H, Frazier J, Kennedy D, Yakutis L, Hill M, Gruen J, Bosson-Heenan J, Carlson H. Association of common genetic variants in GPCPD1 with scaling of visual cortical surface area in humans. Proc Natl Acad Sci U S A. 2012 Mar 06; 109(10):3985-90. Simoni J, Villanueva-Meyer J, Simoni G, Moeller JF, Wesson DE. Control of oxidative reactions of hemoglobin in the design of blood substitutes: role of the ascorbate-glutathione antioxidant system. Artif Organs. 2009 Feb; 33(2):115-26. Khalkhali I, Baum JK, Villanueva-Meyer J, Edell SL, Hanelin LG, Lugo CE, Taillefer R, Freeman LM, Neal CE, Scheff AM, Connolly JL, Schnitt SJ, Houlihan MJ, Sampalis JS, Haber SB. (99m)Tc sestamibi breast imaging for the examination of patients with dense and fatty breasts: multicenter study. Radiology. 2002 Jan; 222(1):149-55.